The George Galt Bourne estate designed by Harrie Lindeberg c. 1920 in Lattingtown. Bourne was the son of Frederick G. Bourne, President of Singer Sewing Machine, who resided at 'Indian Neck Hall' in Oakdale. G.G. Bourne was partner in the stock brokerage firm of Talcott, Porter & Co. According to Spinzia the home is extant on Sheep Lane. 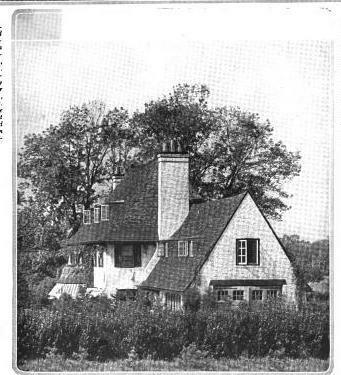 Photo from House & Garden, 1920. Bourne's first marriage ended in divorce and his ex remarried Harvey Dow Gibson and built 'Lands End' on a portion of the Bourne estate. Even though not much of this house can be seen in this photo I still believe there's a common theme to John W. Mackay III's 'Happy House' versus his father's 'Harbor Hill' -- the next generation didn't want to outdo their parents, they wanted to understate them. ^ There's also the big issue of building a house in pre and post income tax eras. Doug and Zach both have it right. As succeeding generations learned to be rich, they also learned how to assert status with more subtle markers. After income taxes and less restrictive lifestyles not requiring a woman to change ones clothes six times a day and a functioning estate not needing a full scale dairy, laundry, power plant, carriage barn, greenhouses. etc. etc. to keep it operating, I also think inheritance played a major factor in the heirs not having as big a pie to share with every succeeding generation. This house also appears to be MIA on Sheep Lane. George Bourne's daughter, Whitney Bourne (later Choate and finally Atwood)became a Hollywood starlet in the late 1930's, causing something of a scandal among the Social Register set at the time. If they only could have lived to see what shocks and doesn't shock today. Ancient- I love the your links. Whitney Bourne Atwood was very much alive and around in my youth. At the time, I had no idea of her Hollywood career and took her to be a typical Locust Valley matron in her Belgian loafers and cashmere twin sets. Who knew she was such a va-va-va voom in her early years? The house is not in Lattingtown, but in Glen Cove on Meadsowspring Lane. I lived in it for over 20 years.